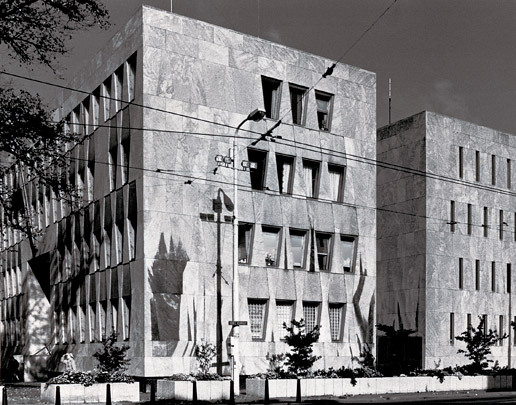 This embassy building consists of two wings, a long one for offices and a short wing for the United States Information Service, the two linked by a glazed volume. At the rear is a freestanding auditorium, its facades clad with rectangular and trapezium-shaped shell-limestone panels; the windows also have this shape. Its outward appearance provoked storms of protest from the townspeople. On firmer ground, though, is criticism levelled at its spatially uninteresting, anonymous, cramped interior.